HealthQuest doctors, massage therapists, and support staff painted and cleaned areas of the HCCAO Head Start facility Tuesday morning. 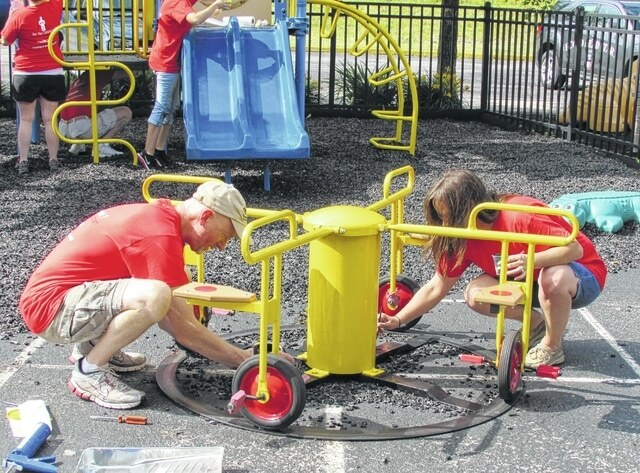 Pictured painting playground equipment are Dr. Rob Prewitt (left) and Melissa Shannon (right). HealthQuest employees gathered on Tuesday for one of several “from the heart” community service projects, as described by owner Dr. Rob Prewitt. Tuesday’s project took place at the Highland County Community Action Organization Inc.’s (HCCAO) Head Start facility. The volunteers helped by painting equipment on the playground, washing and touching up walls, painting the kitchen, and washing busses. “We’re counting our blessings,” said Prewitt, who was among the many volunteers on Tuesday. According to Prewitt, HealthQuest’s four area offices are located in Hillsboro, Blanchester, Mount Orab and Fields Ertel. Each quarter, one of those offices selects a community service project for their area. The Hillsboro office, Prewitt said, selected HCCAO’s Head Start following a brainstorming session. In all, 26 HealthQuest employees volunteered their time at Head Start on Tuesday. Those employees came from all four offices. Prewitt said the Head Start project was the most well-attended so far, comprising roughly two-thirds of HealthQuest’s employees. He added that there were around seven to eight doctors, about eight message therapists, and between 10 to 12 support staff all volunteering. The volunteers, wearing red HealthQuest T-shirts, work for about three to four hours, Prewitt said. Afterward, they meet up for a cookout. The next quarterly community service event will be through the Fields Ertel HealthQuest office. The Blanchester office will host a project for the upcoming Christmas season. According to Prewitt, it was during last year’s Christmas season that the HealthQuest quarterly service projects began. Last December, HealthQuest volunteered at the Matthew 25 Ministries. Everyone who participated “had a fantastic time,” Prewitt added. HealthQuest has also volunteered at a Georgetown veteran’s home. Tuesday’s Head Start event marked its third service project. To learn more about HealthQuest, visit www.turnupyourpower.com.